Photo: Dorothea BylicaNot far from the Charles Bridge and near the American Embassy, in the bustle of the tourist crowds, the sweet smell of fresh baking wafts through the air, along with the sounds of gypsy music. This is how you know you’ve arrived at a Yugoslavian restaurant known as Gitanes. All of us are in some way gypsies. We are always moving somewhere,” says Gitanes’ owner Veso Djorem, explaining the name of his restaurant. His original career was as a journalist, but his focus in life has been on art, with a little bit of the entrepreneurial spirit thrown in. 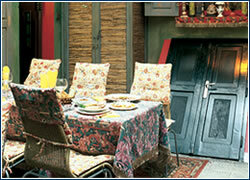 He has created a restaurant from small details and memories which are visible in every corner of the room. Icons, naive paintings, photographs and tools from the individual parts of former Yugoslavia – Croatia, Bosnia and Serbia – an unbelievable testimony to the folklore and cultural traditions of a country that no longer exists. “Neither Heaven nor Earth,” is the motto of Gitanes restaurant. The diverse and lively colors, along with the many different objects that clutter its small interior, certainly evoke the feeling of a home created haphazardly somewhere in between. “The writer Milan Kundera has said that he is only at home when he’s on the road. And it’s precisely this home on the road that is a common characteristic of Gitanes’ most frequent guests – foreigners living in Prague and tourists,” says Djorem. The result is a restaurant enclosed in a vacuum of memories, an oasis of good food and drink for Yugoslavs and Yugo-philes, and, for the many Americans and French who visit, a place for both authentic food and atmosphere. The Yugoslavian cuisine is supplemented by Italian specialties, with the Yugoslavian chef creating out of that a unique culinary mix. 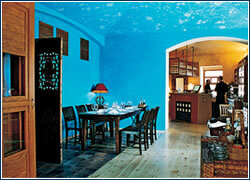 It is important to point out that Gitanes has two menus – one for summer and one for winter. But no matter what kind of food you order, you don’t have to wait idly for your meal. You can pass the time gladly with a traditional appetizer – freshly roasted chips, made from salty dough, with cheese. Among the warm appetizers, the restaurant’s owner recommends the roasted peppers stuffed with cheese. 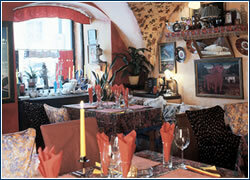 And from the entrées, he favors the Javorina schnitzel with cheese, potatoes and kajmak – a Bosnian specialty. Kajmak can have a different consistency according to the length of maturity; the younger form is similar to butter and is used as a spread. As it matures, it becomes as dense as cheese and can sometimes be lumpy, similar to cottage cheese. Connoisseurs of seafood can choose between many kinds of boiled or grilled types of fish, as well as shellfish. Italian pasta is also offered here, and the chef has cooked up a very popular specialty – pasta alla Trieste, an Italian-Yugoslavian marriage of fettucine with lamb on onion and vegetables. The names of the desserts tell you a lot about the history of the Balkans: baklava, pastries with nuts in a sugar sauce, and tufahija, boiled apples filled with nuts and topped with whipped cream. Some of the ingredients necessary for these specialties are not available on the Czech market, so they have to be imported. These include kore, for pita or baklava, paški cheese from the Croatian island of Pag or travnički cheese from the Bosnian town of Travnik. To accompany these, the restaurant also bakes its own white bread. If you are unsure what wine to drink with your dinner, you should ask for some advice, as the offer is quite extensive. The wine list abounds with varietals – white, rose, red or black – from all over the former Yugoslavia, as well as a fine selection of Czech, French, Italian and Cyprian wines. Still, Yugoslavian wines predominate, prompting the owner to establish a small wine shop called Dubrovnik. Slovenian whites are well represented, and Croatia has contributed some notable labels. Among the wines from Bosnia-Herzegovina, you will probably enjoy the Kamenné – a white wine typical of the rocky Herzegovina region, or perhaps Blatina, a black wine. Montenegro boasts the most popular wine among Gitanes guests, a black wine called Vranac. The wine Tga za jug, a Macedonian name meaning “Homesick for the South”, was the basis for a poetry collection by Panda Kolevsky, a Macedonian poet living in Prague. But it’s not likely that a visit to Gitanes will make you feel homesick for the south. 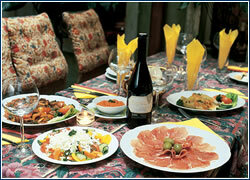 Rather, you’ll end up enjoying the plentiful Yugoslavian cuisine and the wonderful Balkan hospitality. But the owners have seen to it that they introduce patrons to more than good food and drink. “We organize concerts, readings, and opportunities to meet Yugoslavian artists, as well as wine tastings in our wine shop,” says Veso Djorem. The experience he acquired in Sarajevo, where he owned his first establishment – a cult café for artists called Red Gallery – guarantees that a visit to Gitanes will provide you with a cultural experience as well as a gastronomic sensation. AFTER MAKING its mark on the local “instant sandwich” industry, the fine firm of Crocodille introduces the first in what will hopefully become a chain. An attractive variety of hot sandwiches on baguettes are joined by salads, daily soups, and desserts – all available for take-out or dine-in. And unlike most fast-food venues (such as the KFC just across the street), this well-designed alternative has enough atmosphere to make you want to linger over a cappuccino or a slice of cheesecake. How to get there: From Dejvice, head towards Roztoky u Prahy about 5 km, parking on the left.